Amusement parks provide entertainment throughout the year, especially in the summer. Unfortunately, they are not always as carefully maintained or safe as visitors imagine they are. Like other property owners or operators, amusement park owners or operators owe a legal duty to keep the premises reasonably safe for visitors. This includes inspecting for defects and dangers, and then either making repairs or warning visitors about any dangerous conditions. If you are hurt in an amusement park, the premises liability attorneys at Moll Law Group are available to pursue compensation for your injuries or for the death of a loved one. Our Chicago amusement park accident lawyers will investigate the details of your situation and vigorously assert your legal rights. If an owner or operator fails to perform inspections on rides, and this leads to a dangerous condition that causes an accident, the owner or operator may be found negligent on the grounds that it should have known about the dangerous condition. If you can establish the owner or operator's negligence, you may recover compensation for any injuries suffered. Moreover, under the Illinois Carnival and Amusement Rides Safety Act, amusement parks' rides are supposed to be inspected before they are first operated, and then afterward as well on an annual basis. Inspections are supposed to be recorded so that the operators' yearly permits show that they occurred. A ride that must be inspected is any mechanized device or group of such devices that carry passengers along a course for the purpose of providing riders with thrills, excitement, amusement, or pleasure. They may include carousels, go-kart tracks, haunted houses, bounce houses, ski lifts, mechanical bulls, and more. An amusement park that allows a ride to be operated without inspection or the appropriate permit may be subject to not only criminal misdemeanor charges and fines, but also liability for negligence. An amusement park accident attorney at our Chicago firm can help you investigate any misconduct on the part of the park. If you are able to establish negligence, you may recover economic and noneconomic damages, including pain and suffering, loss of enjoyment, disability, disfigurement, medical costs, and lost income. Illinois follows a doctrine of modified comparative negligence, in which your ability to recover damages is reduced by the degree to which you are at fault for an accident. For example, if you slip and fall near a ride because you were not paying attention, your recovery may be reduced by your own percentage of fault. However, you still will be able to recover some compensation as long as you are not 50 percent or more responsible for the accident. Although premises liability is probably the most common basis for bringing a lawsuit after an amusement park accident causes injuries, it may also be appropriate to sue for general negligence or sometimes product liability. 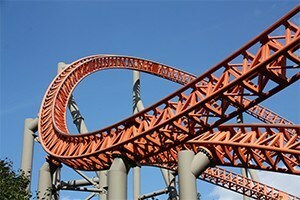 In some cases, a defective part on a roller coaster or other ride is the cause of an injury. While the operator owes a duty to inspect the ride for these types of defects, in some cases there may not be a way for an operator to observe or know about the defect, and when this happens, the manufacturer may be held responsible. If you or your child has been hurt, the Chicago amusement park accident attorneys at Moll Law Group are available to represent you in a claim for compensation against all responsible parties. Our firm represents people in Wheaton, Naperville, Schaumburg, and communities throughout Cook County. Billions of dollars have been recovered in cases in which we have been involved. Call us at 312-462-1700 or use our online form to set up a free consultation with an injury attorney.